This is a tale of two arrests: one of a South African arrested in Mozambique; another of a Mozambican arrested in South Africa. The comparison may be instructive. The first arrest relates to the supposedly jihadist insurgency still seething in Mozambique's northernmost province of Cabo Delgado, where more murders of civilians, usually accompanied by beheadings, have been reported. Among the few people the Mozambican authorities have arrested is a South African professional hunter and charter fishing boat operator called Andre Hanekom. According to those who know him, he is 'an old seadog, not a jihadist'. He was apparently arrested mainly because a few machetes, a small quantity of gunpowder, some maritime flares and a bow and arrow were found on his seaside property at Palma Marine in Cabo Delgado. These objects can be legitimately explained by the work he does, except for the bow and arrow, which was evidently just an ornamental curio. There are also allegations that he's being framed by business rivals. Yet South Africa's International Relations and Cooperation Minister Lindiwe Sisulu issued a statement on 1 January which sounded a lot like she had bought Mozambique's allegation that Hanekom was part of the jihadist plot. 'The people of South Africa and Mozambique share a very deep political history and very strong economic relations. It is not acceptable that a South African citizen is in court for alleged involvement in extreme jihadist activities that resulted in loss of life,' she said. When later pressed on that, however, she insisted that Pretoria had taken no position. Maybe Sisulu's apparent abandonment of Hanekom was intended to placate Mozambique for South Africa's own arrest of Mozambique's former finance minister Manuel Chang at Johannesburg's OR Tambo International Airport two days earlier, on 30 December. This, on the face of it, was a far more legitimate arrest than that of Hanekom. 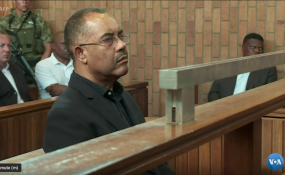 South African authorities arrested him on an extradition request from the United States which aims to prosecute him for alleged complicity in the massive US$2 billion shipping scam that virtually bankrupted Mozambique in 2016. Chang stands accused of conspiracy to commit wire and securities fraud and money laundering. He allegedly pocketed some US$12 million in bribes to facilitate three dodgy deals between Mozambique state-owned enterprises and a French-based shipbuilding company called Privinvest. The total amount of bribes was around US$200 million to Mozambican politicians and officials, three Credit Suisse bankers and Privinvest salesman Jean Boustani, who have also been arrested. But a total of US$500 million remains unaccounted for. Did Filipe Nyusi urge Cyril Ramaphosa to extradite Manuel Chang not to the US but back to Maputo? The Mozambique government raised US$2 billion in loans, mainly from Credit Suisse but also from the Russian VTB bank in 2013 and 2014, to finance three shipping companies. ProIndicus was meant to protect Mozambique's territorial waters; EMATUM was supposed to launch a tuna fishing industry with 27 fishing vessels bought from Privinvest; and MAM was meant to build a shipyard to provide additional ships to ProIndicus and MAM. The US indictment - backed up by many emails among the defendants - alleges that the ideas for the three companies came not from the Mozambique government at all but from Boustani and the three Credit Suisse bankers, for whom the shipping companies were just 'fronts to raise money to enrich themselves'. None of the companies apparently ever caught a tuna or produced anything else of value to the people of Mozambique. The Mozambique government concealed most of the deals and the loans from their own people and the International Monetary Fund (IMF) until 2016 when they were exposed. The IMF then cancelled its financial support to Maputo because it had concealed its true and dire financial positions. All three companies defaulted on the loans in 2017 which nearly bankrupted the country. The prospect of Chang appearing in a US court to spill the beans on the other Mozambican government officials who apparently received even bigger bribes is clearly terrifying the ruling Mozambique Liberation Front (Frelimo). Armando Guebuza was president at the time and there are some indications that this probe could go right to the top. In an election year that could be very embarrassing for Frelimo. So Maputo will be watching anxiously when Chang's bail application is heard in the Kempton Park court on 18 January. The US Justice Department is opposing bail on the grounds that he is a flight risk. Mozambican authorities were apparently taken aback - first when Pretoria arrested him and then when a Kempton Park magistrate confirmed the legality of the arrest. Maputo probably regarded this as inconsistent with the historic fraternal relations between the governing parties of the two countries. When quizzed about this by a Mozambican journalist, Sisulu assured him that South Africa was merely acting in accordance with its international legal obligations, and didn't think the saga would harm bilateral relations. She added that President Cyril Ramaphosa would travel to Maputo the next day to meet his counterpart Filipe Nyusi. Chang and Hanekom's arrests and other issues would be discussed at the meeting. After that meeting Ramaphosa's office issued a bland statement that gave no clue about what the two presidents had discussed, let alone the outcome. Did Nyusi urge Ramaphosa to extradite Chang not to the US but back to Maputo? Maputo keeps insisting that it's lining up indictments of several officials involved in the shipping scam, but no one really believes it. The fraternal neighbouring governments no doubt share an ideological resentment to the US government exercising universal jurisdiction beyond its own shores. It is doing so mainly on the basis that the bribes were paid through US correspondent banks. But Ramaphosa would surely know that justice will not be done, and the truth won't be revealed, if Chang is extradited to Maputo. Both are a lot more likely if he is extradited to the US. One suspects, on the other hand, that Hanekom's appearance in a Mozambique court, if it ever happens, won't be too revealing of the truth. Will he be a sacrificial lamb to help preserve the ANC government's relations with the Frelimo government?